"This chili is super quick to prepare, and is ready in less than an hour. Garnish with cheese." Heat vegetable oil in a large pot over medium-high heat and stir in the ground turkey. Cook and stir until the turkey is crumbly, evenly browned, and no longer pink. Drain and discard any excess grease. Stir in the onion; cook and stir until the onion is tender, about 5 minutes. Add the chicken broth, tomatoes, black beans, kidney beans, refried beans, garlic, chili powder, paprika, oregano, cumin, salt, and black pepper. Bring to a boil, then reduce heat to low. Cover and simmer for 30 minutes. Sprinkle each bowl with a teaspoon of Cheddar cheese, if desired. 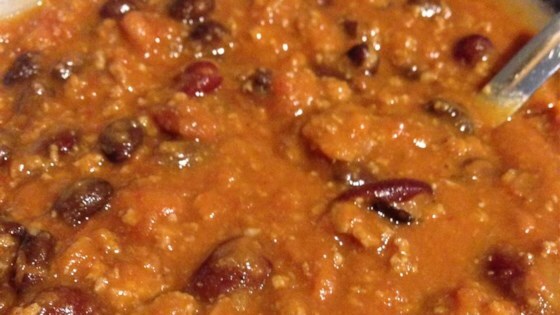 Watch how to make a simple recipe for delicious turkey chili. Delicious and easy. Will be one of my favorites! Thsi was VERY good..could've been a little spicyer though. I used a can of Rotel original instead of crushed - the flavor is amazing - lots of spice! It was delicious. I added an extra 1/2 tablespoon of chili powder to give it a bit more kick. My husband LOVED it and asked me to please keep it in the rotation of meals.